In Moscow a picket organized by the International Workers' Association (IWA-AIT) in solidarity with fired miners was banned. Moscow government authorities have banned a picket in solidarity with fired workers at the Ametistovoe gold field of Kamchatka. Dozens of workers were fired after they launched a strike protesting against deteriorating wage rates. The field is owned by the Kamchatka Gold Company, part of the Renova group of companies. 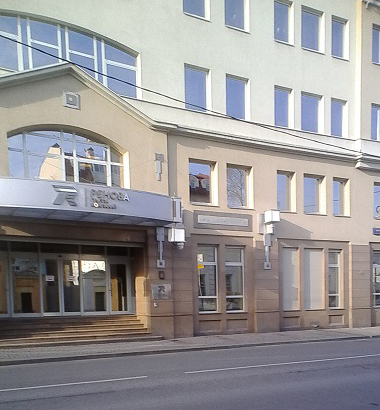 A picket was planned in front of the main office of Renova in Moscow. The task of organizing the picket was taken on by the Russian Section of the International Workers’ Association and other anti-authoritarians in the metropolitan region. It was planned to unfurl flags of the IWA, and raise signs with the slogans: “Renova illegally fired workers in Kamchatka!” “Renova – return money to the workers!” “No to the dismissals!” and “Renova, give the workers back their jobs!” Participants were going to print up and distribute leaflets in order to draw attention to the exploitative practices of the company. However, the authorities of the Central Administration District of Moscow [one of the 12 administrative districts of Moscow] banned the picket. In an official document signed by Deputy Prefect L. I. Tiunova and dated November 26 2018, the ban is motivated by . . . the narrowness of the sidewalk in front of the Renova building and the consequent impossibility of “guaranteeing the security” of the action. As usual, the arguments of the authorities do not stand up to scrutiny. The number of picketers would not exceed five at a time: this number could not impede the normal movement of people along the sidewalk in front of the Renova building, especially since this area is not crowded at the times planned for the picket. It’s clear that the arguments about “security” are completely far-fetched. This is a poorly disguised cover for the unwillingness of those in power to allow a protest demonstration in the centre of the capital, especially one directed against the actions of a group of companies whose head is the billionaire Viktor Vekselberg, closely associated with the current Kremlin leadership. Having banned the picket, the Moscow authorities, as usual, contemptuously “recommended” that those wishing to hold a protest rally do so in in the Sokolniki Park, which is far from the centre of the city. Obviously Tiunova doesn’t understand that it makes no sense to hold a protest against the firing of workers by a particular firm in a park that has nothing to do with either the exploiting company or the fired workers. What makes sense is to demonstrate in front of the company’s offices. More accurately, she doesn’t want to understand, as befits the representative of a government that defends the interests of oligarchic capital. Members of the anarcho-syndicalist trade union initiative KRAS-MAT are expressing their outrage at another manifestation of the despotic nature of government power. We are protesting against this arbitrary action and dealing with the reality that it is becoming harder and harder to conduct labour union activities in the Russian Federation. Nevertheless, we do not intend to give up and will continue our struggle for the self-organization of working people. Thanks to www.aitrus.info for this press release.